TORONTO, April 19, 2018 – The quality of financial reporting is a shared responsibility between auditors, audit committees, and management, according to a new report by the Deloitte Institute for Audit Innovation and Quality. In “Financial reporting: striking all the right notes,” Deloitte takes a broad view beyond the role of the auditor, examining how the interactions and activities of all the stakeholders involved matter as they relate to quality financial reporting. The report, which was co-authored by Richard Olfert and Nathalie Tessier, managing partners at Deloitte Canada, “highlights the optimal conditions that companies can aim for in order to achieve high-quality, transparent, and reliable financial reporting,” according to a Deloitte spokesperson. It then describes four leading practices to ensure effective composition: financial literacy and expertise; onboarding and training; audit committee dynamics; and self-assessment. Each leading practice is broken down into actionable items that are simple and easy to follow. 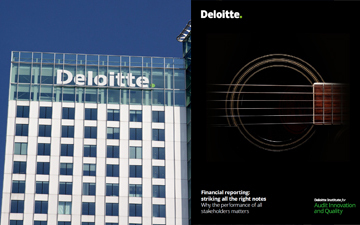 “Financial reporting: striking all the right notes” can be accessed through the Deloitte Institute for Audit Innovation and Quality. Colin Ellis is the managing editor of Canadian Accountant.